Former AllSet Learning intern Parry recently shared this Chinese poem with me. It amazed me with its simplicity. This is a poem that even an elementary learner can get. > nǐ kàn yún shí hěn jìn. > and at clouds the next. > but when you’re looking at the clouds, how could we be nearer! > translated by Gordon T. Osing and De-An Wu Swihart. > I use them nonetheless seeking for the light. There are a few words in there that would definitely need to be looked up by an intermediate learner, but the only challenging grammatical point is the use of 却 (què). It’s so great to have material like this accessible to learners. I’ve tried to maintain a 4-line structure to make comparisons easier, but in a few cases it was inappropriate to break the Chinese poem structures, so I left them as is, since the 4-part structure is obvious anyway. > You say that you love rain, but you open your umbrella when it rains. This is why I am afraid–you say that you love me too. 文艺 literally means “literature and arts,” but these days it’s often closely associated with the phrase 文艺青年, a young person who pursues artistic beauty (especially of the literary nature), but may often come across pretentious to normal people. You’ll immediately notice how difficult the following translation is compared to the first one; it’s chock-full of hard words. You’ll notice a dramatic reduction in length, plus a classical style. 吴语 is a “topolect” of Chinese; it’s the family that Shanghainese belongs to. Shanghainese friends tell me that this version is a little forced and not very poetic (it doesn’t do Shanghainese justice). Seems like it just got tacked on later after a 文艺青年 did the other versions. 女汉子 is difficult to translate, but 汉子 normally refers to a man. So 女汉子 refers to a “manly” woman, or more appropriately a “strong woman,” the type that takes no crap from nobody. “你有本事” (literally, “[if] you have the ability”) lends an air of direct challenge to the whole thing, kind of a “what are you gonna do about it?” feel. This one, like the 吴语 version above, also seems tacked on, since the phrase 女汉子 is trendy these days. 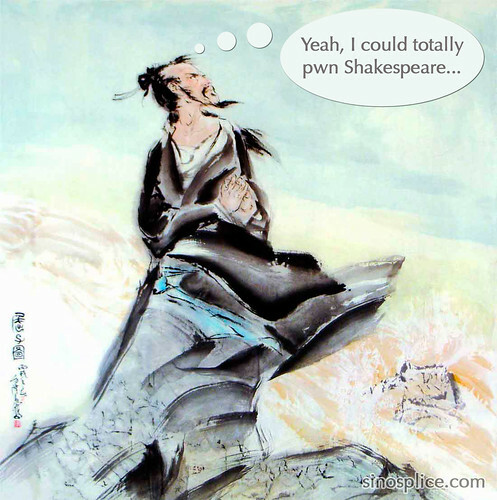 This little experiment certainly doesn’t prove any superiority or “pwnage,” and the English translation was clearly chosen because it matches existing Chinese poem forms, but… Chinese is still pretty awesome. My friend Tom (mentioned once before here) has put together a really cool event which he’s calling “United Verses” (译站 in Chinese). The concept is basically a bilingual poetry reading event. 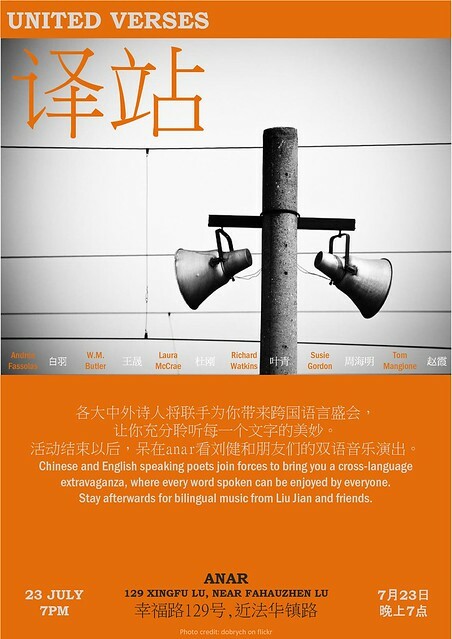 Each Chinese poet will read his poems in Chinese, and then an English-speaking partner poet will read English translations of them. That English-speaking poet will later read his own poems, and his partner poet will read the Chinese translations. This is a really cool cross-cultural activity, and I applaud Tom for putting it together. It took a lot of work to coordinate translators behind the scenes, because the poets themselves aren’t usually the translators. Additional translators are needed, both native Chinese speakers and native English speakers. I participated as a translator myself (as did one of my AllSet Learning clients), and I found it a really interesting and rewarding experience. Not only do you get to discuss the meaning behind the poem with the original poet, but then you also get to discuss your translation into English with an English-speaking poet. This isn’t just basic off-the-cuff translation, and the resulting translations are quite solid. Unfortunately I won’t be able to be at the event myself, because I’ll be out of town. 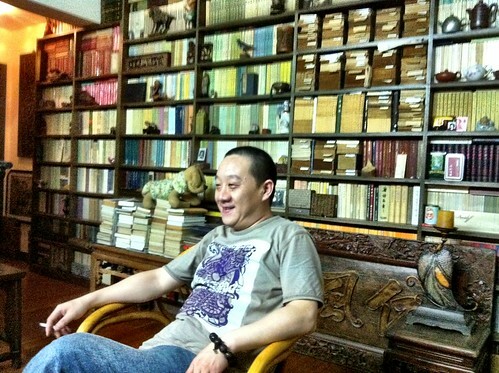 I leave you with a photo of “my poet,” 叶青, a very interesting Shanghainese man, pictured here in his study. Recently a comment on Sinosplice brought to my attention the fact there are many different videos of poems read in ancient Chinese (古代汉语) [more information on Wikipedia’s classical Chinese entry]. In case you’re not familiar with the concept, every language is slowly changing over time. So not only would the vocabulary and grammar of a language be different if you were able to go back in time and observe, but so would the actual pronunciation. The farther back you go, the bigger the change. As you can imagine, it’s difficult work piecing together the ancient pronunciation of a language when there are no audio records. The second one is by a Chinese guy who goes by the name of biopolyhedron. He’s got a bunch of videos on both YouTube and on Youku. If you’re interested in this stuff, definitely check out his videos!